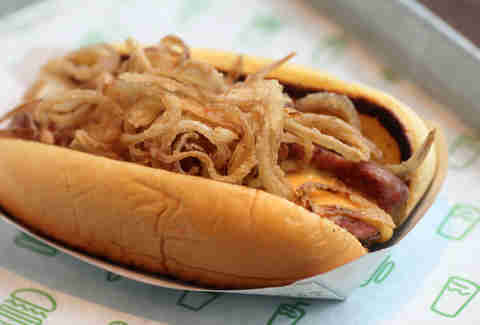 Once a hot dog cart dedicated to spreading the Vienna Beef gospel to New Yorkers, Shake Shack has come full-sausage-circle with the opening of its first-ever location in the dog mecca that is Chicago, finally bringing the East Coast’s choicest burger chain and all that comes with it (flat-top dogs! Gourmet burgers! Crinkle fries! Beer! Concretes!) to River North. 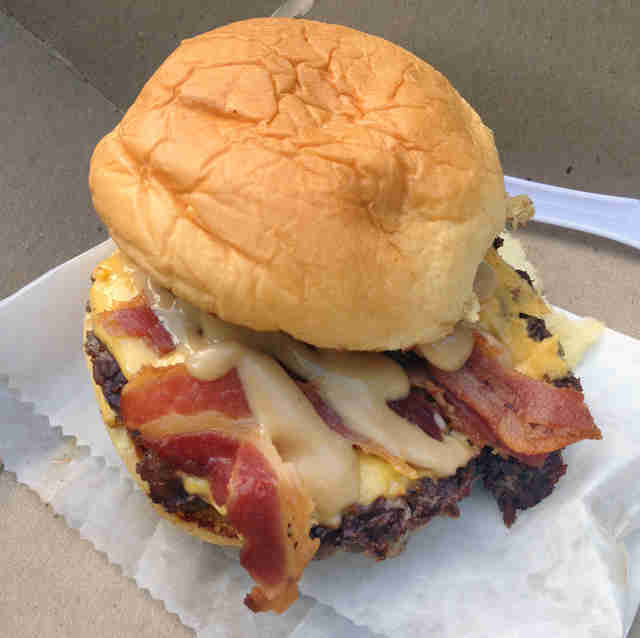 Made with a blend of Angus beef that's cooked medium and sandwiched between buttered buns, your choices include the classic ShackBurger with Shack Sauce (a slightly spicy, sweet and sour blend of mayo, ketchup, mustard, and other spices), or variants like the SmokeShack, topped with applewood-smoked bacon and chopped cherry peppers. 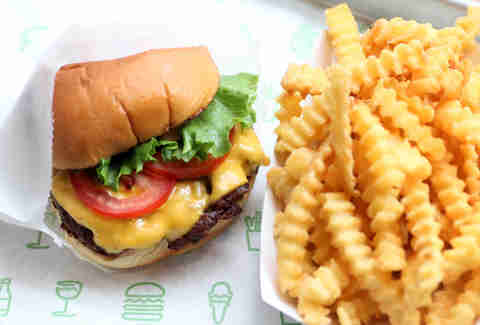 Shake Shack nearly incited a riot last year when it switched from its signature crinkle-cut fries to non-crinkled, hand-cut fries. "Nearly", though, because they decided to bring back the crinkles, which you can now get topped with American cheese sauce and chopped sport peppers. Even though the Shack's burgers lead off the menu, don't sleep on the selection of flat-top grilled hot dogs (figuratively -- not that a bed made of hot dogs wouldn't be amazing). The Shack-cago Dog is an all-natural Vienna Beef dog split down the middle, griddled, and laid in a toasted potato bun with classic Chicago dog garnishes. They've also teamed up with The Publican to source pork for a new sausage item, which they top with cheese sauce and shallots that have been marinated in house beer and then deep-fried. 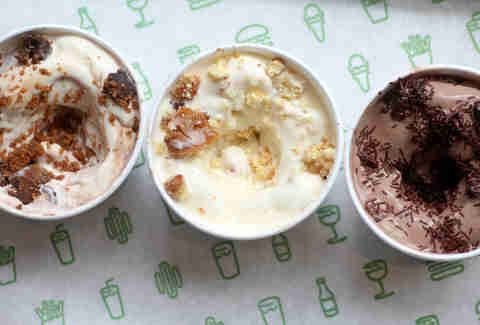 Da S'mores mixes Bang Bang's s'mores pie and its gobs of marshmallow with vanilla and chocolate custard. Salted Carame'L' involves a specially made salted caramel old-fashioned donut from Glazed and Infused that's chopped up with bananas in vanilla custard. The Shack Attack combines Vosges black salt caramel chocolate, fudge sauce, chocolate truffle cookie dough, and chocolate custard, all topped with chocolate sprinkles. 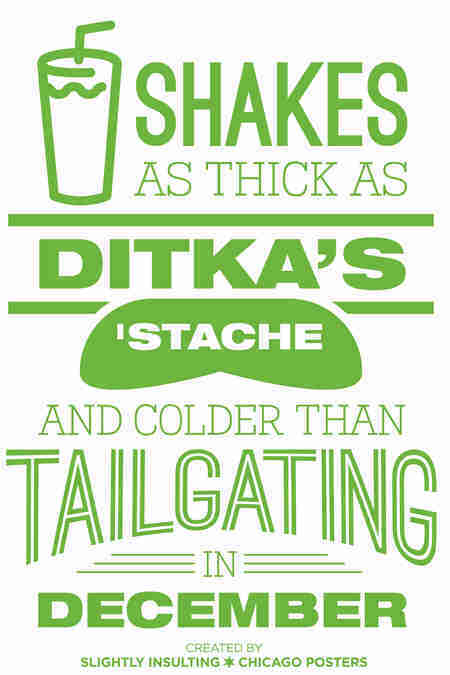 You can also mix your own concrete, and... oh, there're also shakes, but you probably guessed that. 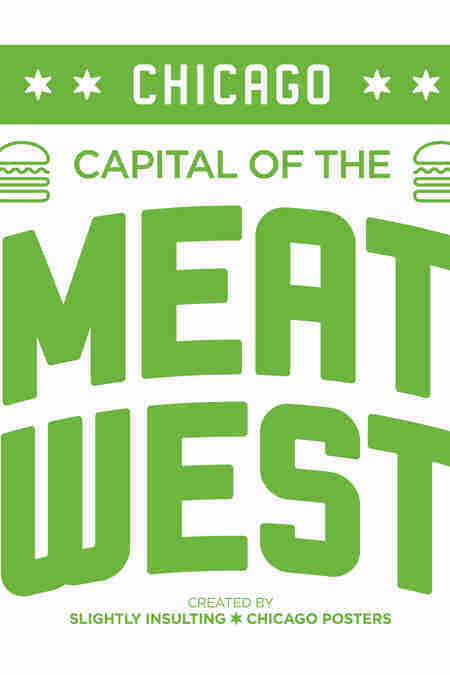 No self-respecting burger chain would be complete without at least a few off-menu goodies (amirite, M Burger?). 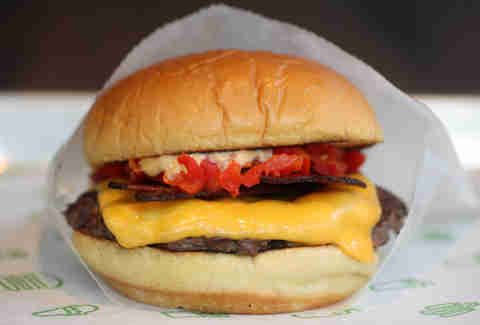 Shake Shack's hidden menu items include a peanut butter bacon burger, grilled cheese, and the option to add the aforementioned Shackmeister-fried shallots to your patty. 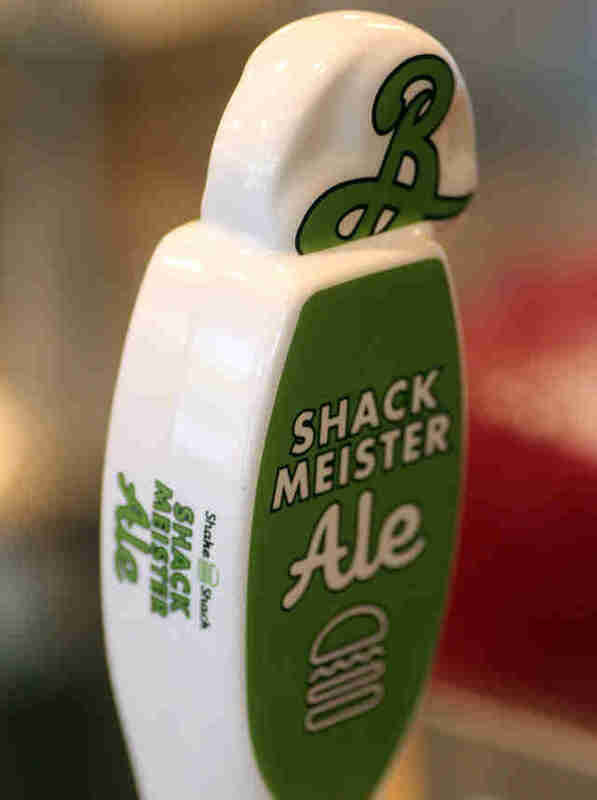 Speaking of Shackmeister, the house ale made by Brooklyn Brewery is meant to be the perfect pairing for the burgers -- light and crisp, but still with a good depth of malty flavor. Shackmeister (plus a few local beers) will be on draft, along with Frog's Leap wine out of Napa Valley. 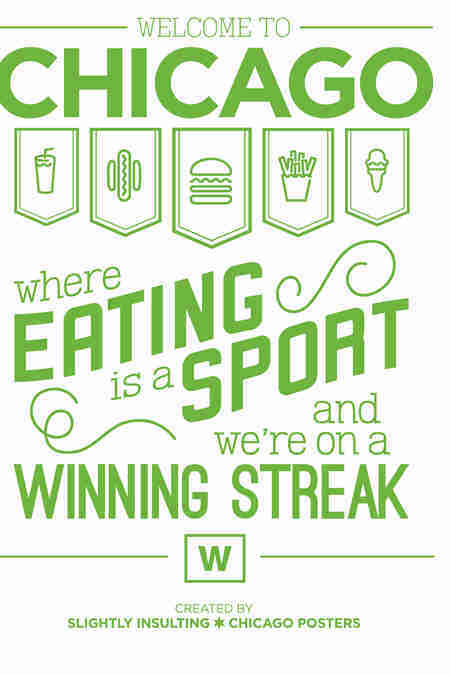 ... Slightly Insulting Chicago Posters. 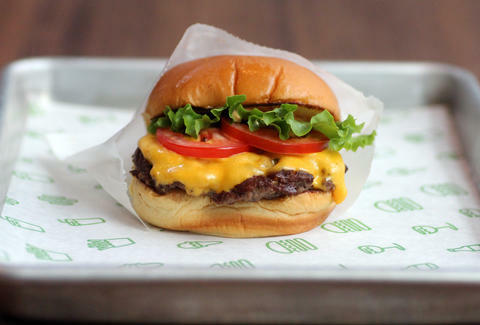 Restaurateur Danny Meyer started Shake Shack to pay homage to the griddle-smashed burgers of his youth in St. Louis (namely from Steak 'n Shake and Crown Candy Kitchen). Inside the latest installation, you'll weave through the line (the express C-line if you're just looking for dessert) before sitting down under string lights at tables made from reclaimed bowling alley lanes. 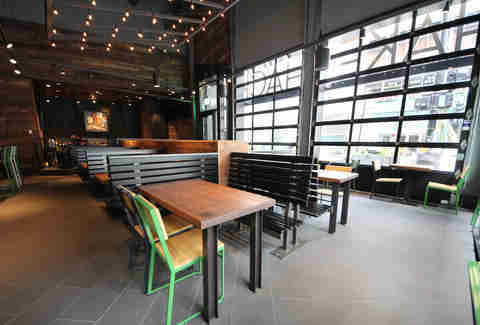 The 90-seat space also has retractable windows for Summer seating. Sean Cooley is Thrillist's Chicago Editor and he's been told he bears an uncanny resemblance to Weird Al. Follow him @SeanCooley.